Close to my house is a Publix grocery store. It is the smallest store that they build, and it replaced an abandoned hospital that was way too creepy to live near for those of us who play Resident Evil. The parking lot is very small, and space is at a premium. There are a variety of other stores there around the lot and everything is typically full. Two days ago I was stopping by this Publix on my way home from the beaches, (we say “the beaches” here instead of “the beach,” because of the way the municipalities there divide them up) and pulling into the lot, spied an especially prized parking space in the first row. As I was pulling in, I noticed a car driving forward out of the next row over, but they were four or five spaces over, and I ascertained that I would be well parked before they drove by on their war out of the lot. It wasn’t really anything I actually thought about, merely one of those thousands of tiny calculations one makes as the drive an automobile. I parked, fiddled a bit with my phone to check my grocery list, got out of the car and walked to the store. I had not yet made the door when I was stopped by a elderly, but energetic, woman. “You are a very rude man,” she admonished me. I looked at the woman. She was short, with the kind of thin brown hair that only comes from thin white hair died brown. She was undoubtedly someone’s dear old grandmother, and she was pissed off at me. “Excuse me?” I said, trying to figure out what this was about. “I’m really sorry, but I don’t know what you’re talking about,” I tried. This was not entirely true though, as I was beginning to get an idea. I thought about the arrangement of the rows of parking in the lot. I wasn’t really afraid of being told on, the manager knows me and likely wouldn’t care even if he didn’t, but putting together the path her car must have taken didn’t make much sense. The brown haired woman opened her mouth to reply, let it hang there for a moment, then snapped it back shut. “You’re a very rude man,” she said finally, turning on her heel and stalking off into the store. Maybe she was right. I’d certainly been called much worse. I mulled it over as I slowly shopped, distracted by my cogitations. As I got to the registers I saw a large cart filled with groceries and I slipped in, just making it with my basket of a dozen items. I looked up to see that I had just jumped in front of the same brown haired woman, who gave me a “Hmph,” and back out to find another register. I nodded to myself. Apparently she was right. You owe her a rum cake. Probably. Good thing I don’t know who she is! Heck, you can give me the rumcake, heh. Too good. Thanks for sharing. I loathe that Publix…just because of the parking situation. 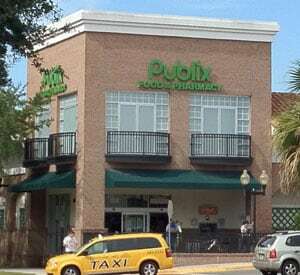 I love the Publix, but the parking is a hassle, no doubt.